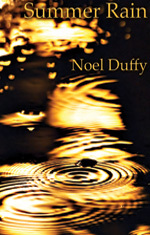 Noel Duffy’s third collection, Summer Rain, takes the form of three sequences: the first, a drama, set in late 19th century Vienna, recounting the final years of Austrian physicist Ludwig Boltzmann’s life. The second is a series of fifteen observational nature poems based on the cycle of water, reimagining the ideas of the Romantic Poets through the lens of 21st century knowledge. The final sequence is a series of intimate dramatic monologues unfolding in modern day Dublin as the Summer Rain of the title drifts in and out of the awareness of the ten speakers. These new poems follow on from Duffy’s earlier work, examining how the ideas of science and the experience of living collide and elaborate when viewed through a shared prism.